In GP, there are some 'Document Access' security operations. Ex.) Purchase Order Window, 'Document Access' options for Standard, Drop-Ship, Blanket, Drop-Ship Blanket. 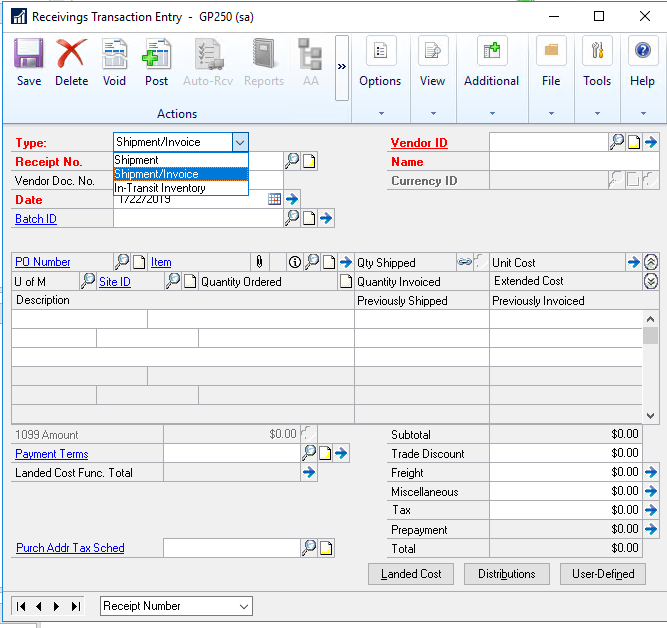 Assuming I'm not just overlooking options for the receivings transaction types (Shipment, Shipment/Invoice, In-Transit Inventory), what are some other options to grant a person access to the receivings transaction entry window but ultimately prevent them from being able to enter shipment/invoices? You are registered for GP Power Tools including the Developer Tools module. This can be easily written as a quick trigger and assigned to the users you want to lock down, or to all users. There may be a couple of options including a Field Level Security option. The options in this post seem reasonable, but I haven't tried them yet. Both options were suitable and will do the trick!